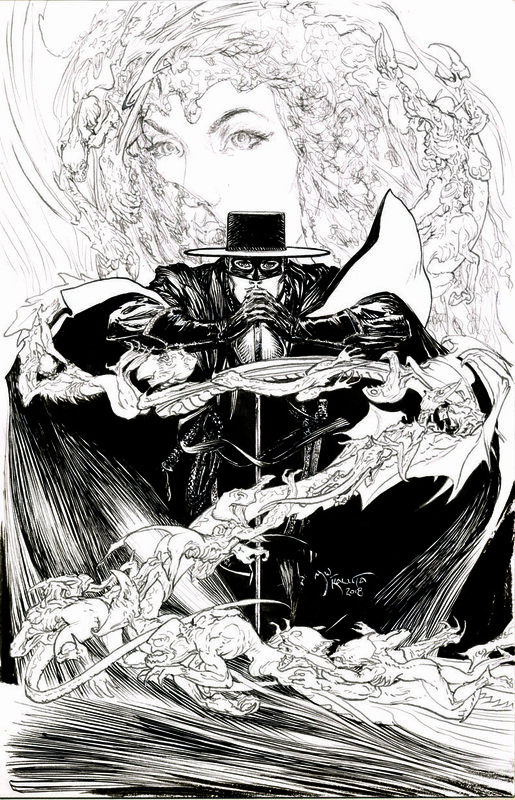 [Baltimore, Maryland] – The company that announced to fans a new line of Zorro comics just last month, promising to take the iconic fan favorite character in bold new directions, has another major announcement regarding the comic series. Renowned comic artist Michael Kaluta has signed on to produce art for the books, helping to lead up to the character’s 100th-year celebration in 2019. He is a multi-award-winning artist for his work in comics over the last five decades. No stranger to pulp hero action, he promises to pack even more punch to an already exciting series taking Zorro into dark waters as he battles supernatural beings and demonic forces. The artist’s work will be showcased beginning with the new series’ planned second story arc Zorro: Sacrilege. Fans of the artist will have even more to celebrate as Kaluta looks to return to his ERB roots by contributing to American Mythology’s upcoming Carson of Venus series and the horror title, Eternal Thirst of Dracula.